Two weeks ago, we got a call from the Durham Humane Society in Whitby. They might sound familiar to you. That's where we picked up little Velvet just days before Christmas! That was a happy day. This time around, it was just a preliminary visit to meet an old, very sick little beagle named Lilo. She might sound familiar too. News about Lilo spread like wildfire on social media. She'd been replaced by a puppy and unceremoniously dumped at the shelter by her family. Heartbreaking enough but much moreso due to the fact she was mostly blind, deaf, and prone to pacing in circles. She fit our criteria of course and we were prepared to take her on the spot, but this is a shelter like no other. They wanted to help with her medical as much as possible. They had her in to see a vet followed by an assessment with a neurologist in Toronto. All the while, they placed her in a loving temporary foster home through the shelter. They tried a treatment plan for a week as recommended by the specialist but there was sadly no improvement. Lilo likely had a serious medical issue, perhaps a brain tumour. There was no quality of life left to offer her. They had to make a very difficult decision. We support them with all our hearts. But there is a happy side story here. That same day we met Lilo, the staff asked us if we'd like to meet another senior beagle girl guessed at 8 to 10-years-old, who had arrived earlier that day. Her story was just as sad. A well-meaning young family rescued her from someone else who had posted her for sale on Kijiji. One look at her and this family knew they had to take her if only to save her from whatever life she was enduring up until then. She was in terrible shape. Her dull, unhealthy-looking coat was matted and smelly. Her nails were long and her ears were filthy. She seemed to be in pain when she moved. They took her without hesitation. Sadly, her new life with this family was short-lived. One of their children quickly developed an allergy to her and that's how she found herself at the shelter…alongside Lilo. 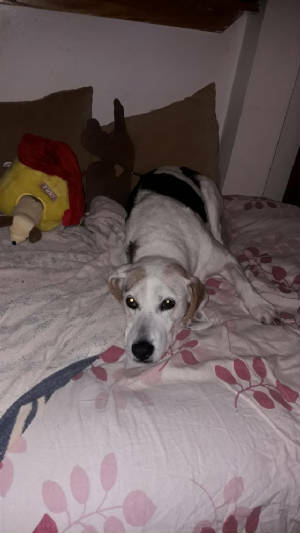 The family had provided some veterinary care for her in that short time she was in their care, including putting her on medication for significant arthritis in her hip, but she still badly needed a dentistry. Once again, this shelter went above and beyond the call of duty. Her mouth is now rid of the painful rotting teeth that had been causing her so much discomfort. It's time she found some stability in her life and a whole lot of love. Welcome to the First Day of Spring, little one. We can't wait to watch you bloom.